Next Tuesday is pancake day, or for the more traditional among you; Shrove Tuesday. I think historically it came about so people could use up ingredients before starting lent fasting, but don't quote me on that. In my house everyday is pancake day, or at least I wish it was! Pancakes are one of my favourite foods in the whole wide world, whether it be thick american style pancakes drowning in maple syrup with a side of bacon or the more traditional crepe style pancake with lemon and sugar. I am pretty sure I could live on pancakes alone. I do still occasionally make traditional pancakes on weight watchers, and as long as you don't go wild with the sugar they aren't that bad! But like with most food I can't just eat one or two... (hence my need for weight watchers). So, when I came across the idea for this recipe I was intrigued. It was actually a pin on pinterest with half a recipe written underneath. (btw I hate when people do this, the picture links to the source so you don't need to reproduce it verbatim on pinterest!) 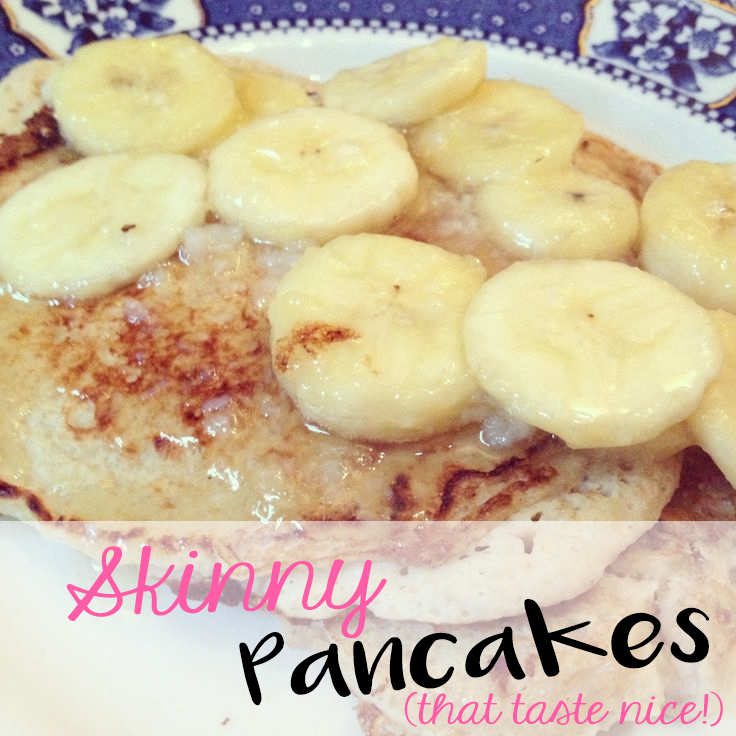 These pancakes had no flour and only egg whites which sounded like weight watchers heaven! The recipe had no measurements so it was a bit of an experiment, I mean, I know a lot of pinterest recipe ideas tend to be wildly inaccurate or overstated - cauliflower mash anyone? *gag*. A great carb-free pancake recipe. The batter was very thick so took some encouraging to pour but the end result was delicious! I think on their own they might be a little dry, perhaps a splash of milk added to the batter would of helped. Although with a syrupy or yoghurty topping they work a treat! So there you have it! A fantastic low carb and low propoint breakfast treat! If you are looking for some other fantastic pancake ideas, check out thisgreat post from Sarah (Maison Cupcake) on Baby Centre. 13 fabulous pancake recipes from some great bloggers! Oooo these look right up my street! Nelly I just had these for lunch. I left out the banana and vanilla and included a dessert spoon of 0% Greek Yogurt and about 25g of feta cheese. I blasted the lot together with my stick blender. Delicious with salad on the side. I will do again and include some sun dried toms I think. Thanks for posting the recipe. 5 Top Tips to Eating out on Special Occasions. Meal Planning Monday - 4th February.